← Look at the SKIN of SKINNY! 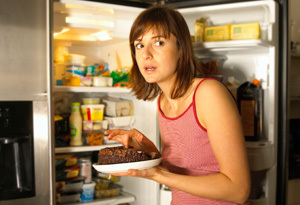 4 Reasons for Nighttime Cravings During a Diet and Resolutions! Sometimes people crave food at night. There are reasons for this. 1. The most common is boredom. Answer: Combat boredom with evening exercise, walk the dog, find something physical to do. Or take a class, volunteer, join a group from a tennis club to a poker club. Find a good book or movie and immerse yourself and keep food out of the area. Make sure you have a non sugary drink to keep you busy throughout and make you feel less hungry. 2. Hunger that was not satisfied during the day. Answer: Make sure you eat 6 proteins, spread out every 3-4 hours and get your two servings of salad, fruits and vegetables. Don’t eat your last protein at 5 pm if you are planning to stay up late. Plan your meal times. You might need an anti-depressant or therapy. Talk to a doctor and/or a therapist. Do not skip meals. Make sure you eat breakfast, lunch and dinner–with three protein-based, low carb snacks after each, a few hours after each are consumed. You might need to lock up all the goodies in the house and have someone else hide the key if you truly cannot have sweets available without eating them. Or better yet, don’t buy them in the first place. 4. You are still coming off of a sugar high. IF YOU HAVE TO EAT SOMETHING!!!! If you absolutely must snack, have healthy protein based options handy so you’re not tempted to start foraging for junk. Cheese, meat, nuts, fresh fruit is an excellent choice, as is a cup of herbal tea. I have low carb hot cocoa from Lindora if I am needing something late at night. There are other choices for low carb drinks online. There are appetite suppressants. Talk to your doctor. Coffee became a huge appetite controller for me…..but everyone is different. Tell your spouse, friends, or other family members to help support your efforts by not snacking in front of you and by motivating you to stick with your plan.